America has become Alzheimer Nation. Nothing is remembered for more than a few minutes. The news media, which used to function as a sort of collective brain, is a memory hole that events are shoved down and extinguished in. An attack in Syria, you ask? What was that about? Facebook stole your…what? Four lives snuffed out in a… a what? Something about waffles? Trump said… what? Let’s pause today and make an assessment of where things stand in this country as Winter finally coils into Spring. As you might expect, a nation overrun with lawyers has litigated itself into a cul-de-sac of charges, arrests, suits, countersuits, and allegations that will rack up billable hours until the Rockies tumble. The best outcome may be that half the lawyers in this land will put the other half in jail, and then, finally, there will be space for the rest of us to re-connect with reality. What does that reality consist of? Troublingly, an economy that can’t go on as we would like it to: a machine that spews out ever more stuff for ever more people. We really have reached limits for an industrial economy based on cheap, potent energy supplies. The energy, oil especially, isn’t cheap anymore. The fantasy that we can easily replace it with wind turbines, solar panels, and as-yet-unseen science projects is going to leave a lot of people not just disappointed but bereft, floundering, and probably dead, unless we make some pretty severe readjustments in daily life. Yes, The Federal Reserve is removing its excessive monetary stimulus at a sloth-like pace. And home price growth is actually accelerating with the February Case-Shiller HPI growing at 6.34% YoY. Home price growth is still growing a greater than 2x hourly earnings growth and has been since 2012. 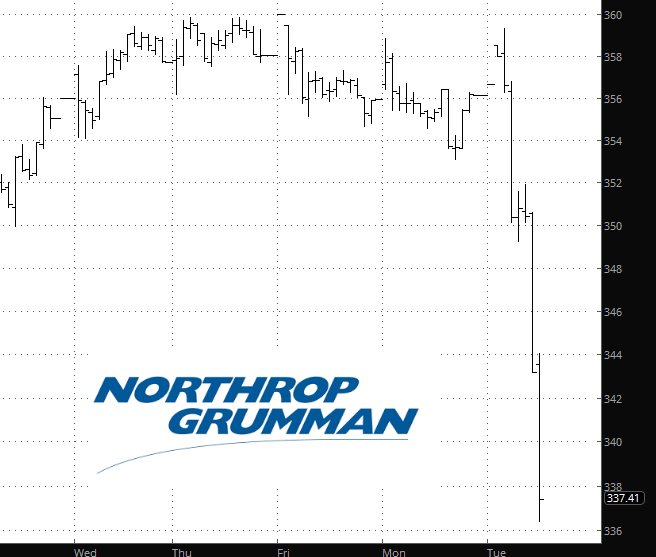 Among my shorts are companies that make money by developing weapons to slaughter human beings (to say nothing of the fact that Pentagon spending is, more than anything else, responsible for plunging our country into ruinous debt – – a debt that will never be repaid). Anyway, it’s nice to see war manufacturers suffer. Apocalypse Now. SPY’s move lower over the last 3 days has set up a potential “Turnaround Tuesday” scenario. The fact that it made a lower high, lower low, and lower close for at least the 3rd day in a row triggered the following study. The numbers are impressive and the bounces couldn’t get much more reliable. 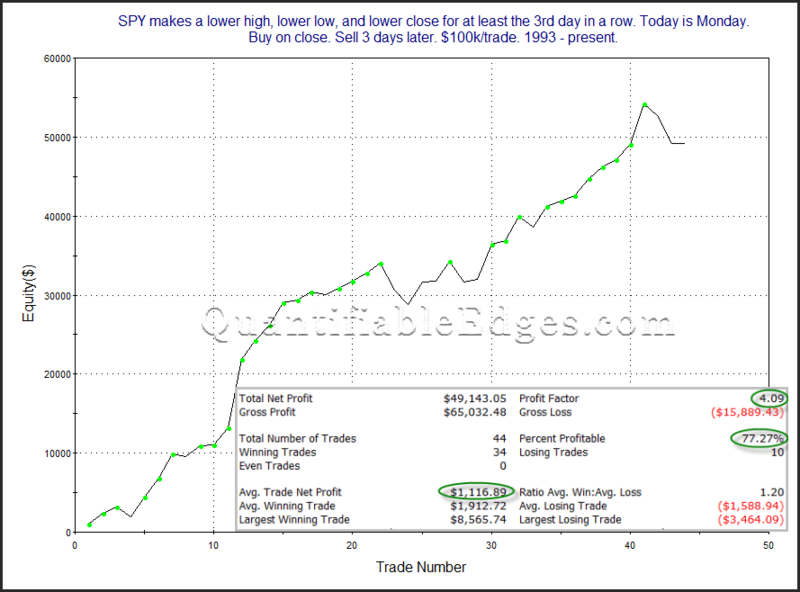 In all but two instances SPY has managed to bounce at some point in the next four days. Much of the edge has played out in the first 3 days. Below is a 3-day profit curve that I shared on StockTwits / Twitter yesterday about 30 minutes before the NYSE closing bell. The strong, steady upslope is encouraging. I will note that while SPY closed down slightly yesterday and was able to qualify for this setup, SPX actually closed up slightly. This could leave the study in doubt. But as I discussed in last night’s subscriber letter (free trial here), QQQ clearly met the criteria on Monday. And QQQ’s stats have been similarly impressive. So traders may want to keep this study in mind when establishing their trading bias. Equity bulls need a “shock to the upside” to get them back into their long-accustomed feather bed of new lifetime highs every day. Some thought last weekend’s “North Korea Peace Fest” would do the trick. It didn’t. New hope was offered after Monday’s close when GOOGL announced blowout earnings. 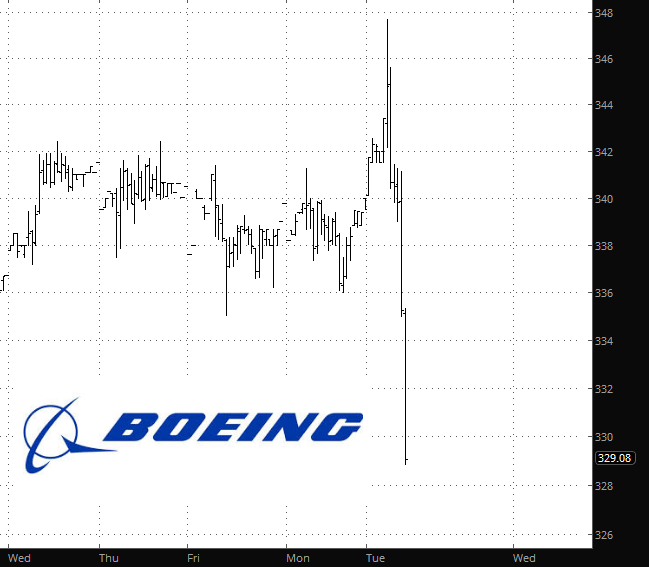 It looked like just what the doctor ordered, as the stock roared nearly 50 points higher instantly. 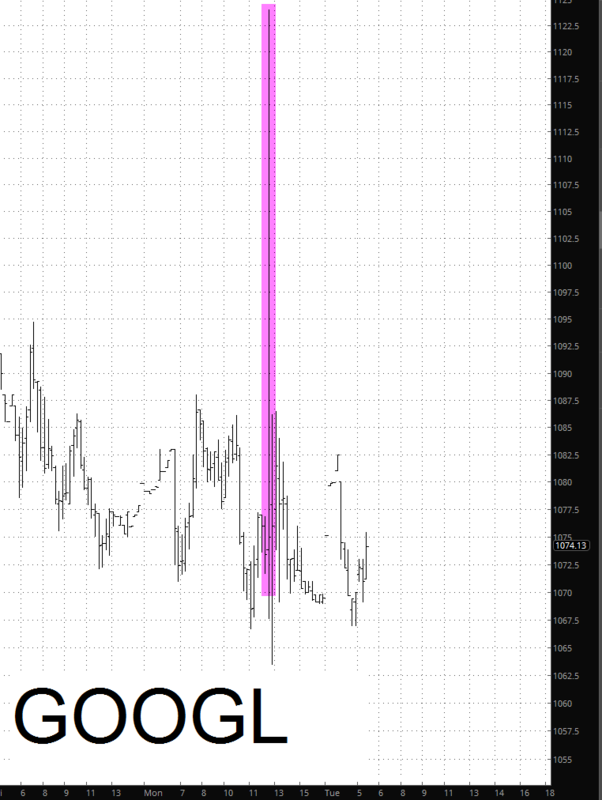 As you can see by the tinted area below, it wasn’t exactly long-lasting, and you could almost hear the face of GOOGL call owners drop in despair. Still, the ES and NQ are both green as I’m typing this, with the ES up about half a percentage point. Annoying as that is, the intraday chart over about the past week still makes plain the broader trend of lower highs. Raise your hand if you’re surprised that Sean Hannity owns $90 million worth of rental properties. Are you fainting that Fox News’s man of the people, who rails against Hollywood elites before hopping on his private jet, has extensive investments? Were you shocked to read in The Guardian that he snapped up dozens of these properties at fire sale prices after they’d been foreclosed on by banks? NO, OF COURSE YOU’RE NOT. The Hannity Hypocrisy Hour has been on teevee for eleventy years, and we’ve all developed antibodies by now. This week it’s Commodities, specifically an aggregate view of commodities and a look at valuations. Commodities as an asset class rose from relative obscurity to become a popular addition to portfolios by the more innovative asset allocators in the last 10-15 years. Although the “commodities supercycle” perhaps overstated some of the historical return statistics, it’s clear that commodities go through cycles and there is fairly clear economic logic behind the argument that they can offer diversification benefits. But given the nature of the chart below, rather than dwell on portfolio construction aspects, I will focus on the cycle dynamics, and where commodities sit at this point of the market cycle. 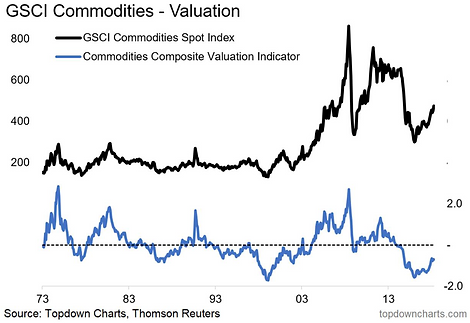 The chart shows the GSCI, which is a relatively popular diversified commodities index, and our composite valuation indicator. The bottom line is that after what has already been a solid rebound, commodities still look good value at this point. With the yield curve hitting its flattest level of the expansion last week, many are wondering what impact that will have on the stock market. Data Sources for all tables herein: NBER, FRED, Bloomberg. Using monthly data. The yield curve is a leading indicator of the economy, but the stock market is one as well. So to provide advance warning for stocks, the yield curve must be a longer leading indicator. Looking back at history, that does seem to be the case. 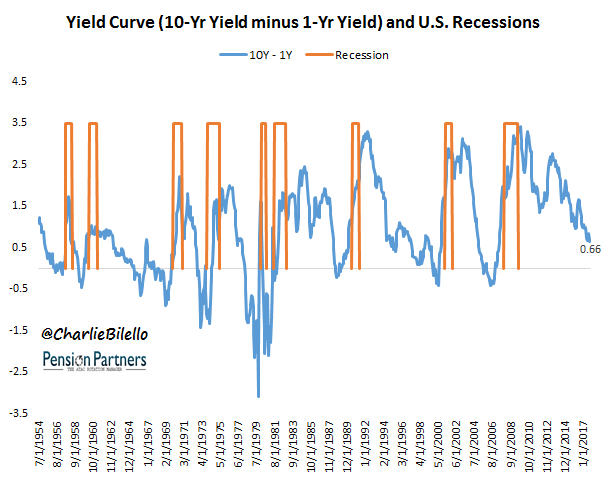 The yield curve has inverted before 6 out of the last 9 recessionary stock market peaks, with an average lead time of 8 months. The current US Treasury yield curve in between the 5-year and 10-year maturities is today just 15 bps. It had dropped down to this level of flat about ten days ago. When it did, it had been the first time in almost eleven years. 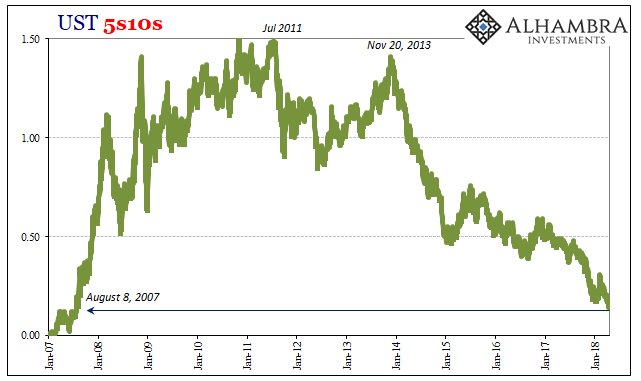 The last time the 5s10s was 15 bps? August 8, 2007. It’s hard not to notice these things, depicting as they might a completed cycle or round trip. August 8 was the day before the system broke for good, and so the Treasury curve was then steepening after having been inverted for a good length of time beforehand. That kind of curve action, as my colleague Joe Calhoun rightly points out, is accepted as the worst kind. You never want to see short-term rates fall faster than those of the long end. It indicates things are about to get serious, or at least that is what the market expects (and it has been the market, not Economists and policymakers, that have been correct about all this). While true in the sense of the future short-term direction, I think there is a level worse below such bear steepening. A much more desperate condition is what we find now, this long end flattening. What’s missing from analysis is the other dimension. Nominally, rates are rising across the Treasury curve. They are increasing much faster and farther at the short end than the long. That seems to be consistent with what’s normal, of course, and we have expected as much at whatever point the Fed had finally gotten around to its “exit.” But not all flattening is the same, either. Which Political Team Do You Support? Most people support a political party in the same way they support a sports team. The support is through thick and thin, regardless of the policies that are being proposed/enacted. And criticism of their team is not tolerated, because, well, it’s their team. People love to be part of a team. One consequence of the team-spirit aspect of politics is that the average person doesn’t decide the appropriateness and efficacy of a policy by objective analysis, but rather by who is proposing/implementing the policy. If the policy is put forward by Party A then the supporters of Party A will claim it is a good idea and the supporters of Party B will be critical, whereas if the identical policy is put forward by Party B then the Party B supporters will be in favour of it and the Party A supporters will be critical. In some cases a policy put forward by a particular party will be so obviously bad that the more rational supporters of that party will be unable to come out openly in favour of it, in which case they usually will remain silent. They are like the one-eyed sports fans who shout abuse when the referee makes a bad decision in the opposing team’s favour but turn a blind eye when the referee makes a bad decision in their team’s favour. Continue reading Which Political Team Do You Support? A December 2016 video covered an extremely rare signal that occurred in 1982 and 2016. Since then, markets have reacted in a bullish manner, meaning we have no reason to doubt the long-term signal that occurred at the end of 2016. Therefore, it may be helpful to understand the stock market’s volatility profile between 1983 and 1985. While there are numerous fundamental differences between the early 1980s and 2016-2018, both periods experienced a breakout from a long-term period of consolidation. Was it easy to stay with the new secular bullish trend that began in 1982 and continued into calendar year 2000? 1983 started strongly with the S&P 500 posting a YTD gain of over 22% in early June. The early gains were followed by an 8.76% drop that featured a double-bottom above an upward-sloping 200-day moving average. I was sent this article, which uses TA as a basis to debunk those who think the stock market must crash for gold to be bullish. I thought I’d comment publicly since it is such a divisive subject. There is a misconception out there that in order for gold to have a bull market the stock markets have to crash and burn. Gold investor literally pray for the stock markets to crash so they can get their bull market in the PM complex. Once an idea like that gets embedded into the minds of gold investors it becomes hard for them to see the truth. A simple combo chart can show you the truth about why the stock markets don’t have to crash in order for gold to enjoy a bull market. Well, since I am probably fairly prominent out there in the interpipes with a view pitting Amigo #1 (Stocks vs. Gold) as a key consideration to turning the macro, I’ll assume that Rambus, the writer of the above either has me in mind or other people with various counter-cyclical, anti-risk ‘on’ views about gold. First let’s bullet point a few things pertaining to the quoted material above. I don’t mean for it to sound like I am personalizing this, but since I speak from my own perspective that’s how it may sound.